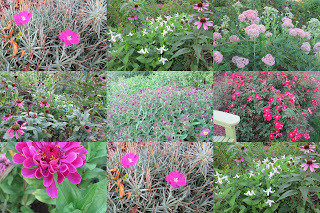 Welcome to Garden Bloggers' Bloom Day for September 2012. Here in my USDA Hardiness Zone 6b garden, we are recovering from the Drought of '12, having been blessed with quite a bit of rain in August and now September. As I look around the garden now and think back to July when it was so hot and dry, I am amazed at what is blooming and re-blooming and I am thankful to have any garden left at all. 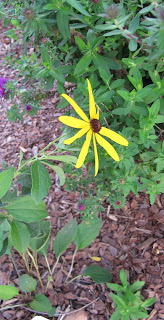 I am thankful for the one flower of Sweet Black-eyed Susan, Rudbeckia subtomentosa, pictured above. I bought one seedling of this native plant at the spring plant sale at the Indianapolis Museum of Art and planted it at edge of the border called August Dreams Garden. Had I known it would not see rain for three months, I might not have purchased it, so I'm glad I didn't know then what I know now about the drought because it is a sweet addition to my garden. I hope that it grows and reseeds wildly in future years. I am also thankful for the little blooms of the Oxford Orphanage Plant, Kalimeris pinnatafida 'Hortensis'. I got this plant directly from the gardens of Elizabeth Lawrence when I visited there earlier in the summer. Rest assured that this prized plant, which Lawrence would likely have known by the name of Asteromea mongolica, will be planted out in the garden before the end of the weekend so it can establish itself long before the ground freezes. I am thankful for many other blooms in my garden. 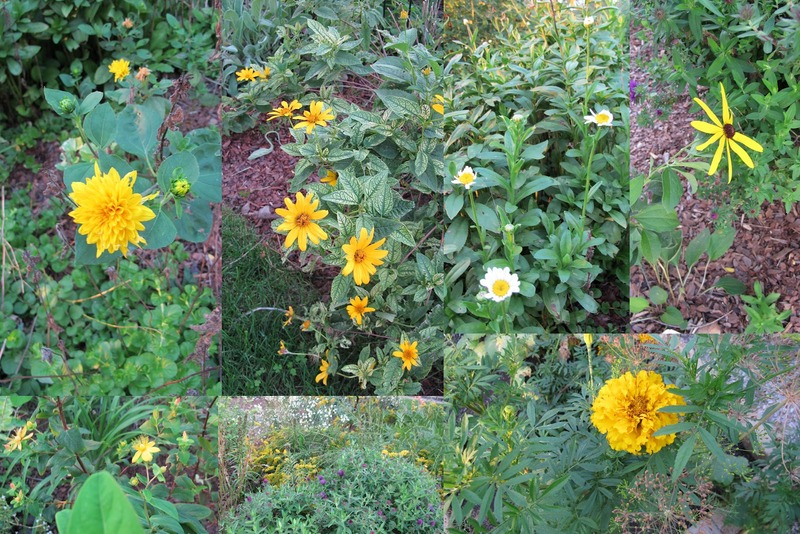 In fact, there are so many blooms to be thankful for in my September garden, beyond the usual asters and sedums that one would expect to be blooming now, that I'm showing them as two collages rather than one by one. There are scads of pink and purple blooms. There are also lots of yellow blooms. Did I mention I was thankful to be looking back on the drought rather than wondering when it will rain again? How's your garden blooming on this mid-September day? We would love to have you join in for Garden Bloggers’ Bloom Day and tell us all about what is blooming in your garden. It’s easy to participate and all are invited! Just post on your blog about what is blooming in your garden on the 15th of the month and leave a comment to tell us what you have waiting for us to see so we can pay you a virtual visit. Then put your name and the url to your post on the Mr. Linky widget below to make it easy to find you. I am grateful to be looking back as well. The dry summer was quite a challenge. We have had some rain recently, and it has made such a difference. I hope all of us get some much needed rain. Thanks for hosting! I wish the rain had been a bit more evenly distributed this year, we here in UK have had way too much and you have had so little. Despite that our gardens seem to survive, yours look lovely and all those pink flowers are just gorgeous! 'Hortensis' is lovely, Carol. How lucky you are having this special memento From Elizabeth Lawrence's garden. So glad you're recovering from the drought. It's still pretty dry here, but the light showers we've gotten recently are certainly better than nothing. Happy September, and Happy Bloom Day. Thank you for hosting. It's terrific to hear that you've had some rain. The pinks in your garden are beautiful, and those yellows add some cheery colour as well. I just love the Kalimeris. It's quite a lovely thing. Over here Downunder, Spring has just begun. Here in the tropical north however, the dry season rolls on. We're in our sixth month of the dry, but that's pretty commonplace for this time of year. Thankfully there are some lovely blooms around the place. So much in bloom! My garden is revitalized as well.... so nice to really enjoy it again! I love those collages; such a great way to offer lots of images. You are lucky to have finally received some rain. We only had a couple of inches in Aug. and about 1/2 inch so far in Sept. All of Wisconsin is under varying degrees of drought. Hi Carol. Your pinks and yellow's are pretty in the garden. It has been dry here as well with heavy rains later in the summer. There are sure signs of an earlier Fall on the way. The grasses and later blooming perennials seem to be ahead of schedule like everything else. Thanks for hosting GBBD! Thanks for hosting another GBBD. The summer has been a tough one, but fall rains have meant some recovery has been possible. 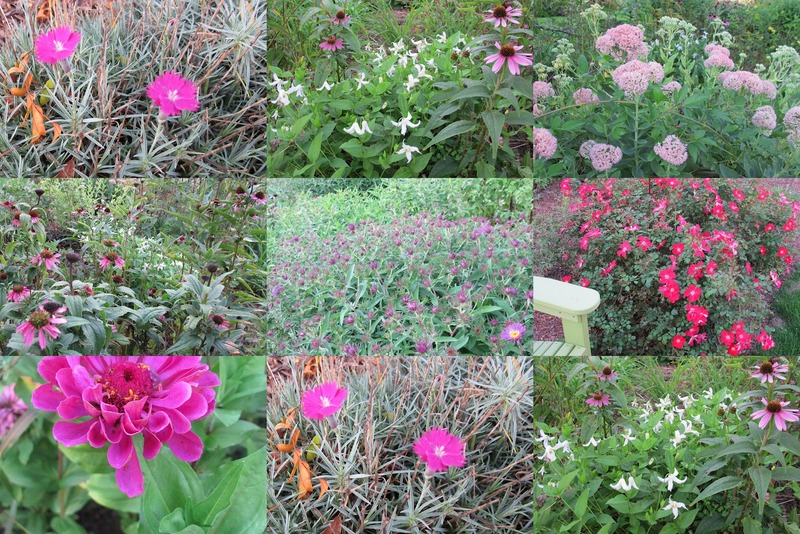 Your pinks in collage are beautiful. Sorry Carol, my first attempt at a link is wrong. If you can remove the first link I would be grateful. For the terrible drought, your blooms are gorgeous! We've been very fortunate with plenty of rain this year, but the blooms in our garden are fading quickly. I definitely need to add some color--thank goodness it's almost pansy time, as well as time to select some new perennials! Thanks so much for hosting Bloom Day! Hope you have a lovely weekend! I know well the feeling of relief and gratitude in looking back at a drought rather than feeling its dusty foot on my neck. I'm so glad you've had some rain. So have we, and although Austin is not out of drought yet, we are grateful to have had a reprieve this year from the dreadfulness of last summer. Your garden is looking quite lovely in fall. You may have to change your blog title to September Dreams Gardens. Your plenty of blooms didn't tell any suffering from previous drought. It is different if you are in a tropical setting, most of the plants stay there always unless they succumbed to the very hot dry season. But we don't run out of colors even then. Thanks for the hosting again. Your groupings of pinks and yellows are lovely! Hi! My courtyard is never in good shape when I return from Hollydays... so there are not many blooms to show. Still, I invite you to visit my blog! Greetings from Portugal! It has certainly been a different and somewhat challenging summer no matter where we are in the World. It is great to be able to catch up and see how others are doing. Thank you for hosting this meme. I'm glad you've gotten some rain at last Carol. We appreciate the opportunity to showcase our blooms with all of the great company you keep here at MayDreamsGardens. Good luck and continue success with your lovely gardens! You do have lots of flowers this bloom day Carol. Aren't you thrilled with the rain that has graced the gardens lately? I am too. Happy GBBD. It is a hugely busy time of year here, but I so enjoy my "appointment" here in mid month! Haven't posted here in ages. Glad I saw Sage Butterfly's post for GBBD which gave me the inspiration to come back. Good morning Carol! Thanks for hosting GBBD - I so enjoy it!! Love your new Kalimeris but had to take a hard look to see if the Scabiosa I planted wasn't actually a Kalimeris. But no. They are similar in some respects but not the same. We too have had real weather extremes here in southern Ontario over the summer. Things are improving now. 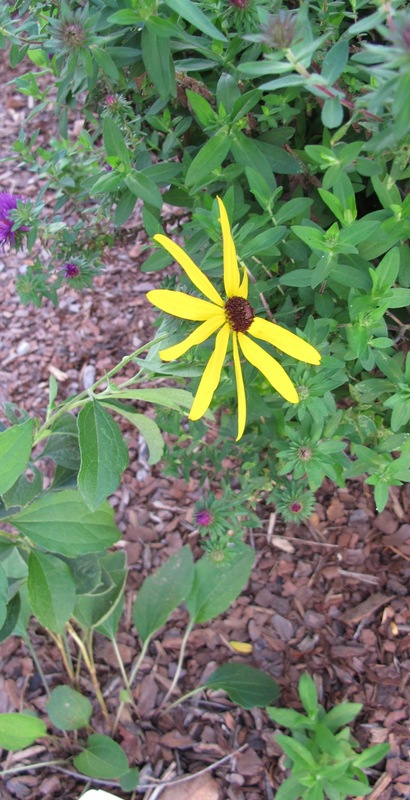 I couldn't decide which I liked more: your pink flowers or your yellow - both are beautiful. I share your gratitude, Carol. As you say, back in July, I wasn't sure I was going to have much left in the garden in September at all. But everything is looking so good right now. All those pinks and yellows sure make your garden cheery! Hopefully after watching an Illini football win, I'll have time to get a post up later in the day. Our garden came back with a vengeance too. Complete with a war between our zinnias and dahlias. Yesterday we finally got some substantial rain. It has been ugly here for the last 3 months as the drought took most blooms and what is left looks like a mid fall garden...so it is nice to see that yours was restored...too late for mine as trees are in their fall color or just dropping leaves...I can take solace that next year it will all be different again...lovely blooms Carol and thx for hosting. For some unknown reason the link to my post didn't work. Take a peak at my renter's garden which I installed at my own expense and hardwork. Unimaginable that a house as nice as the one I'm renting had absolutely NO landscaping. Now I have a nice garden in front and a deck garden in back. I am very glad that you are now getting some rain. Happy GBBD and thanks for another month! Pinks and purples blooming with the complimentary color of yellow! Despite the drought, your garden must be beautiful right now. I really love that sweet little oxford orphanage plant, too. Just adorable! Thanks for hosting. Hooray for rain and the abundance of September! Glad that your drought is finally over! Thanks for hosting this fun event each month! I love those late-summer colors that have defied the drought in your garden,Carol. They're beautiful. Happy GBBD, and let's keep hoping for more rain. I'm happy to see that your gardens survived the drought, and so colorfully. We too have had some much needed rain. Of course it rains here like clockwork during the annual Walnut Valley Bluegrass Festival. Thanks for sharing. despite the drought, you still have quite a few lovely blooms! happy gbbd! I am welcoming cooler weather, though we're predicted a 90 degree day again. It's time to take September cuttings. Those of you in cool climates can think about sowing seeds of next spring's poppies and such. I'll wait for November. Yellow and pink are the colors I have most of all year! Glad you're over the drought. Love your colour collages, great idea. Thanks for hosting! So glad to hear you've come out the other side of.the ugly drought, and that many of your plants survived! It has definitely been a challenging summer. So many plants look so much better now than they did in June and July. Thanks for hosting! We've had rain here in Austin- the plants are happy as can be!! Thanks for seeing what happens where it actually rains! Your abundance is really coming back after your dust-bowl-like summer, isn't it? The composite photos are very fetching. Thanks for your leadership and inspiration. Like your garden look back mosaics. Good that you Finally got some rain. Welcome Fall. It's great to see your garden recovering from the heat and drought. Here in Southern California summer was a little slow in coming but boy is it here now! I'm looking forward to the cooler, wetter seasons ahead. I think we'll all miss summer, but not everything that goes with it! Happy Bloom Day! Thanks, hostess with the mostest! Thanks so much for hosting GBBD! Many thanks for sharing your blooms and allowing me the opportunity to share mine. LOVE that Clematis winding through your Purple Cone Flowers. Great combo! All the yellow you have makes smile at this time of year when there is a nip in the morning. I'm glad you got some recent rains. We got some in New Mexico, too and the plants are happy campers! Thank you so much for hosting! Dear Husband out taking photos of all the bounty of beauty right this very minute! Hot and dry in suburban Maryland right now, and we expect rain tonight, so all is great and glorious! We are thankful for the sun and shade, the obedient plant, the aster, the dahlia, the rose, clematis, dead nettle, butterfly bush, sage, and sedum all blooming and buzzing with bees and butterflies! Too many blessings to count....Now, can I get my fairy compost delivered? Carol, I love that you still have so much color despite the drought. So glad you got rain! (Glad we did too but the ground is dry again...) Thanks for hosting, as always! Thanks for hosting another GBBD!!! Thanks so much for hosting GBBD! Thank you for sharing your blooms and inspiring others like me to share theirs, too. Thank you, as always, for hosting GBBD. I am on the road and having a lot of problems with my internet connection so I hope I can link. Wanted to say how happy I am that you are recovering from your drought. Good luck! Bookworm (@RamblinGarden). Glad you have had rain, i hope i have done this bloom day correctly, please forgive for being late. Your pinks & purples are lovely (dianthus and coneflowers are two of my faves)! And I'm thankful as well to be moving into fall garden season. Happy Bloom Day! Wonderful to hear your drought is broken. What color and life in your garden this September. Happy Bloom Day! It looks like you've survived the drought and your plants are making up for lost time! I've blogged on mixing annuals with perennials for more variety and included a photo of a napping bee. Happy Bloom Day! In my garden I'm enjoying salmon zinnias, buddha's hand cosmos, dahlia lambada, and some lovely roses. Your garden seems to have rebounded nicely. I notice your dianthus rebloomed; mine did not. But my creeping phlox did! So glad to hear you have had some rain. I am featuring one of my favourite plants this month, the Rangoon creeper, Quisqualis, so I'd love you to drop by. Great blooms for such a dry summer!! I had the Kalimeris pinnatafida in Virginia and loved it. Was really thrilled to find it this summer and now am happy to have some in my SC garden. Constant performer! Thanks for hosting GBBD, Carol! I always like to see what's in everyone else's gardens... My blooms are rather sad this September (still no rain), but I'm learning about some awesome plants to try next year! Beautiful bloom day!!! Thanks for hosting. I'm glad to hear you've had some rain and are even enjoying re-bloom in some cases. I have a few flowers this month that are reblooming, too. Thank you for hosting GBBD, Carol! Glad you can look back and see your drought as history. We have had stunningly nice weather in September, but almost no rain. It's hard to knock weather in the 70's though. I try to keep the flowers watered in the meantime. HI all - Got the post up in time then had to run off to the Heritage Harvest Fest at Monticello for Fri-Sat -- so am very late with forwarding the link. Better late than never, right? BTW I love late summer gardens and seeing all of your blooms - it is a lush, relaxed time of year where we can have a bit of a lull and enjoy the fruits (and flowers) of our labors. I love pink and yellow together. And I love rain! Fall is coming! Thanks for hosting GBBD! A day late with an extra dollop of blooms. Jumping in with all the latecomers! 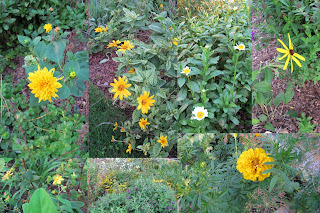 September blooms posted...better late than never....as always, thanks for hosting GBBD each month! I love the collages of the pink flowers — just gorgeous! Thanks, as always, for hosting! Isn't it wonderful how some of the flowers come through for us even in dry conditions. I have some of those this month, featuring some I grew from seed. Thanks for hosting! Late this month, since I was away over the weekend. I think all of our gardens breathe a sigh of relief and look fresher and perkier after the heat of the summer passes, and it rains again, and the nights are cool. A good time of year in the garden, for sure! I love those yellow blooms. It so lovely! Thanks a lot for the post. Lovely! 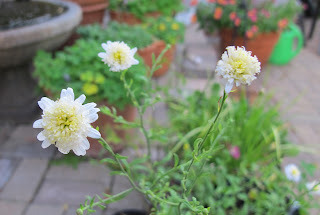 So excited to be posting on Garden Bloggers' Bloom Day for the first time! I have found so many great blogs via these monthly posts.